This time of year my Facebook feed fills up fast and furiously with dubious political information and salubrious photos of apple-picking adventures and followup apple pies. The former definitely leaves a sour taste in my mouth, but so can the latter, especially when I consider the prospect of local apple cider vinegar. I’d originally planned to keep this column hyper-local, focusing on the process of making apple scrap vinegar in my own kitchen. You take the trimmings and cores of the 6-8 apples used to make a pie and stuff them into a sterilized quart mason jar. Mix 3 cups warm, non-chlorinated water with 1/3 cup raw local honey until the latter dissolves and then pour the mixture over the scraps. Top the jar with a scrap piece of cloth and a rubber band to keep the fruit flies out but let in the wild yeast floating around in the air. Keep the jar on the counter for about a week, stirring it daily, during which time it will start to ferment and smell a bit like hooch. Vinegar tenderizes meat very quickly. Because the chicken brines for only roughly 10 minutes (and never more than 20), this is a quick and easy weeknight dish. While the chicken is not as puckering as salt and vinegar chips, you can definitely tell they are made of the same ingredients. To highlight the apple-ness of Maine-made vinegar, I like to serve this with an apple and arugula salad dressed with oil and apple cider vinegar. Place chicken, skin-side down in a non-reactive bowl just large enough to hold the pieces in a snug, single layer. In a large measuring cup, combine the vinegar, salt and sugar and stir until the salt and sugar have dissolved. Pour the brine over chicken. Let sit 10-12 minutes. Remove the chicken from the brine. Pat dry and rub with cooking oil. Discard the brine. Preheat the oven to 350 degrees F. Heat a grill pan over high heat. Place the chicken, skin side down into the pan. Cook until the skin picks up grill marks, 4-5 minutes. Turn the chicken over and slide the pan into the oven and cook until the internal temperature of the chicken reaches 165 degrees, 8-10 minutes more. Remove from oven and serve hot or cold. 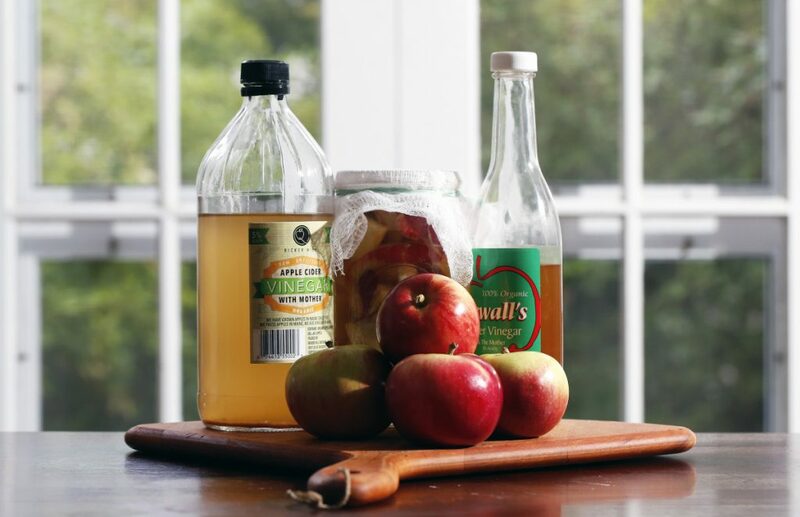 After a week, strain the apple scraps from the liquid, compost the scraps, return the liquid to the jar, cover it with a solid cap to prevent evaporation, and let it ferment until you like the taste, 2-3 more weeks. When it’s to your liking, strain it one more time into a bottle and use it as you would any other vinegar for cooking, cleaning or general health and well-being. But my research on vinegar-making also told me that the most effective way to keep mold from growing in the fermenting vinegar jar was to add a shot of already made raw apple cider. This addition both speeds up the fermenting process and makes the environment inhospitable to mold spores that may have been riding on your apple peels. I didn’t see the logic. If I already had a bottle of apple cider in the cupboard, why would I need to make more? Also, two very good organic apple cider vinegar makers in Maine do a better job than I can: Bob Sewall of Sewall Orchard in Lincolnville and Harry Ricker of Ricker Hill Orchards in Turner. Sewall starts his day with 2 tablespoons of his vinegar mixed into eight ounces of water. He’s totally convinced of both the health benefits and culinary opportunities that the raw apple cider vinegar he’s made for over 30 years affords him and his customers. Sewall presses the cider from the organic apples he grows and picks just as they start to drop from the tree, a telltale sign of ripeness, he says. The vinegar is cold-aged in barrels for a minimum of three years, sometimes longer if he tastes it and deems that it needs a little more mother or a bit more cider to help it ferment for another year in the barrel. The end product is clear and the golden brown of a good aged rye whiskey. That bit of sediment on the bottom of the bottle is the mother, a naturally occurring cellulose that forms from the bacteria that changes cider into vinegar. The taste is sour and smooth at the same time, a flavor that makes it popular with Maine chefs including Sam Hayward of Fore Street, David Levi of Vinland, Melissa Kelly at Primo and chef Frank Giglio at Three Lily Farm. 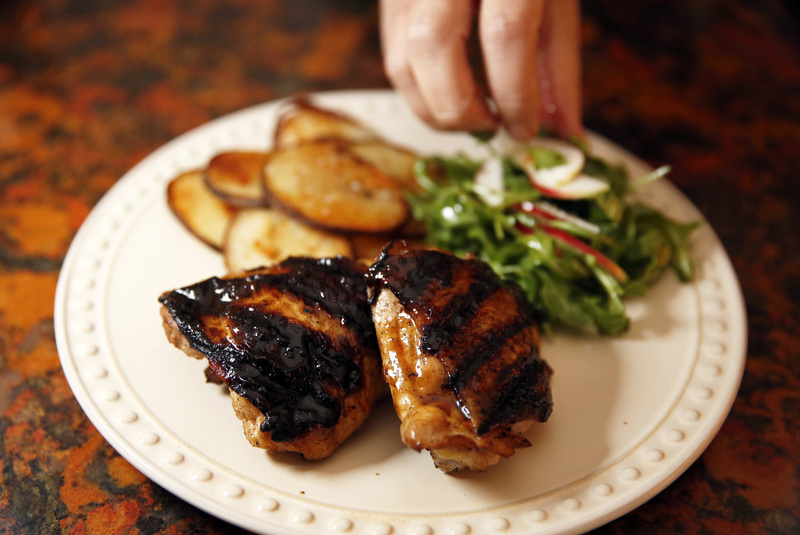 Salt and Vinegar Chicken with potatoes and salad. Sewall sells his vinegar for $20 per gallon, $12 for a half-gallon and $6.50 for a 12.7-ounce bottle. He distributes it to health food stores throughout Maine or customers can pick some up on the farm if they email him ([email protected]) a couple of days before they want to get it. This year, because of several recent dry summers, he expects to put only 2,000 gallons of cider into barrels, which could lead to a shortage once the vinegar has aged to his standards. Harry Ricker, who prefers to drink the hard cider his family also produces and mainly mixes Ricker Hill’s organic apple cider vinegar with oil to dress salads, has the opposite problem. His family used to age vinegar in barrels too, but they went higher tech in the early 2000s when they bought a mechanical acetator. The device cuts the time it takes to make vinegar from cider from three years to three weeks. “We made the purchase to meet the growing demand for cider vinegar as a health food. That demand didn’t grow as we expected, so we’ve got plenty of Maine vinegar on hand now,” Ricker said. Ricker’s vinegar is lighter in color but still quite clear and the taste is just a tad sharper than Sewall’s. You can find Ricker Hill Cider Vinegar in both health food and smaller grocery stores throughout Maine. I found my 32-ounce bottle for $6.99 at Bow Street Market, where it shared a display case with Ricker Hill’s Mainiac hard cider, sweet apple cider and Cortland apples. The marketing ploy worked, as I bought all four products to show my support for the Maine apple industry. Correction: This story was updated at 12:30 p.m. Friday, Oct. 12, 2018, to correct the spelling of Bob Sewall’s last name.